The planet Mars represents the active emotional and vital projections of the self towards the outside world. It is the active male pole, personifying strength, courage and enthusiasm. Without its influence, no interest, passion or determination will ever develop. Mars is the planet of deed, and encourages mechanical abilities, self confidence, endurance, organisation and leadership qualities.Astrologically Mars mainly affects brothers and relationships between friends and associates whereas within the residence it mainly affects females of the family. In the home this area is well suited for a bedroom. It also works well for a living room, a fireplace area and is also a good place for electric installations and storage. In fact heavy storage here can minimise the negative qualities of Mars on a karmic level! It is a good idea to keep this area clean and tidy. You can offer the gemstone coral to Narasimhadev and place it in the South should a suitable place be available. Artefacts or images depicting the elements earth and fire or any of the above mentioned qualities of the South stimulate positive Vastu here as is storing heavy potted plants with large leaves to provide the Earth element. You can use a dash of any of the colours extracted from this Narasingha Yantra above, for choice of decor in the South of your personal space. In the workplace, it is a good place for a cafeteria, relaxation area and security office, heating or lighting systems. Any room using fire, electrical storage would be a positive room function. People whose constitution has too much of the fire element or Pita or those who have a strong negative influence of Mars in their horoscope should avoid this area for long periods of time. Since fire and earth pervade here you can avoid a clash of elements by not storing water on or near this point. This area should not be kept open and light and neither should there be extraneous activities be performed here. Over time weak Vastu in this area (South) may lead the negative aspect of Mars to manifest; chaotic and destructive forces that can lead to thoughtlessness, competitive spirit, impulsiveness, accidents, injuries, financial losses, animosity and war. In terms of your health watch out for measles, mumps and tendencies for infections, fever, colds and allergies. Whilst chanting the Narasinghadev mantra you can place the Narasinghadev Yantra (see above) on a Tuesday or any other auspicious time and day, in the South point of your home or workplace. Any severe spatial deficits can be further transformed and harmonised with the installation of the Vastu pyramid in the centre of your property or on the South point of your building and it will work in conjunction with the Narasinghadev yantra on your wall. You can thus nullify any Vastu discrepancies on the energetic and karmic levels and thereby create an auspicious space for you, your family as well as within your work space. When this direction is properly utilised we can discover prosperity and success in your life. Become enthused and motivated in your endeavours as well as protected from unnecessary financial losses. 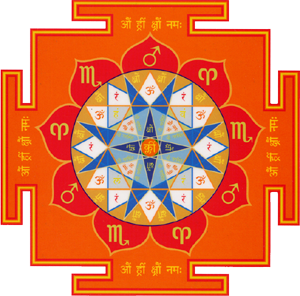 The planet Mars represents the active emotional and vital projections of the self towards the outside world. It is the active male pole, personifying strength, courage and enthusiasm. Without its influence, no interest, passion or determination will ever develop. Mars is the planet of deed, and encourages mechanical abilities, self confidence, endurance, organisation and leadership qualities. The do’s: In the home this area is well suited for a bedroom, It also works well for a living room, a fireplace area and is also a good place for electric installations and storage. In fact heavy storage here can minimise the negative qualities of Mars on a karmic level! It is a good idea to keep this area clean and tidy. 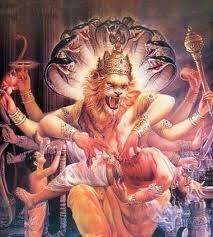 You can offer the gemstone coral to Narasimhadev and place it in the South should a suitable place be available. Artefacts or images depicting the elements earth and fire or any of the above mentioned qualities of the South stimulate positive Vastu here as is storing heavy potted plants with large leaves to provide the Earth element. You can use a dash of any of the colours extracted from this Narasingha Yantra above, for choice of decor in the South of your personal space. In the workplace, it is a good place for a cafeteria, relaxation area and security office, heating or lighting systems. Any room using fire, electrical storage would be a positive room function. The don’ts: People whose constitution has too much of the fire element or Pita or those who have a strong negative influence of Mars in their horoscope should avoid this area for long periods of time. Since fire and earth pervade here you can avoid a clash of elements by not storing water on or near this point. This area should not be kept open and light and neither should there be extraneous activities be performed here. Possible Negative Outcome: Over time weak Vastu in this area (South) may lead the negative aspect of Mars to manifest; chaotic and destructive forces that can lead to thoughtlessness, competitive spirit, impulsiveness, accidents, injuries, financial losses, animosity and war. In terms of your health watch out for measles, mumps, infections, fever, colds and allergies. The Positive outcome: When this direction is properly utilised we can discover prosperity and success in our lives. 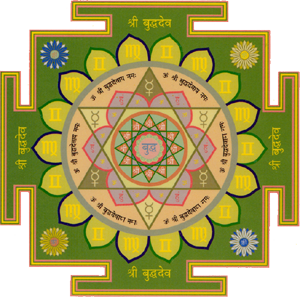 Whilst chanting the Narasinghadev mantra you can place the Narasinghadev Yantra (see above) on a Tuesday or any other auspicious time, in the South point of your home or work place. You can thus nullify any Vastu discrepancies on the energetic and karmic levels and thereby create an auspicious space for you, your family as well as within your work space. Become enthused and motivated in your endeavours as well as protected from unnecessary losses. Any severe spatial defects can be further transformed and harmonised with the installation of the Vastu pyramid in the centre of your property or on the south point of your space and it will work in conjunction with the Narasinghadev yantra on your wall. Astrologically Mars mainly affects brothers and relationships between friends and associates whereas within the residence it mainly affects females of the family.